I believe this country cannot thank Kwame Nkrumah enough for his immense contribution to the liberation and the independence of this country and even the continent as a whole. Some 56 years ago, he declared this country ‘free forever!!!!!! !’ when he delivered that memorable speech on the eve of independence. Anyway, he declaring this country a free state will merely be described as a remarkable oral presentation if it is not really seen in our lives. One of the philosophies I uphold in life strongly is that, the general condition of a country reflects the individual conditions of the citizens. Meaning the state of the nation represents the collective states of the individual citizens of the country. If you would agree with me that there is a certain level of truth in this statement, then you might just agree too when I say this country is not necessarily a free country. This is not something I am cooking up but it is simply depicted in the way and manner in which we commemorated the just past independence day. *do you sense where I am going with this?*. RLG decides to throw a big party for the entire country a night before independence day and guess what, Chris Brown makes a guest appearance. Chris Brown makes a guest appearance worth 1 million dollars to commemorate a day set aside to remember the toil of our forefathers in gaining independence for us from colonial rule. It may interest you to know that even when I close my eyes I can still see the irony in the situation. One would have expected RLG to organize a concert that would sensitize people as to the need for independence and one that would grant people the opportunity to express their appreciation to God for how far He has brought us as a country. Anyway our thoughts are not their thoughts besides it is their money, they are at liberty to spend it any way they chose to. It would be very wrong on my part to throw insults at the management of RLG for throwing that much money at the feet of a foreign singer to help us celebrate OUR independence. Totally wrong!! Yet my problem with RLG is – RLG is a local company which is into the manufacturing of laptops and what not, I cannot count the number of times I’ve seen the CEO on TV advocating the need for Ghanaians to purchase made in Ghana goods, hence, Ghanaians should buy RLG laptops over Apple’s Mac Book. Meanwhile, this same company decides to bring in an outrageously priced foreign artiste for a concert a night before independence day. I am completely lost. RLG just gave Ghanaians the license to do same when it comes to their choice of laptop brands. The saga of the ‘listen to what I say but do not do as I do’. Definitely a Toshiba laptop is more expensive than an RLG laptop and definitely more durable. As of now, we have just been given the license to buy laptops that are more expensive and more durable though they were made by foreign companies. I had the opportunity of watching the excerpts of the Chris Brown concert. No, when I say I had the opportunity of watching it, it doesn’t convey the message I want it to. I actually went on youtube to look for excerpts, since I heard about the controversy surrounding what Chris Brown did on stage. 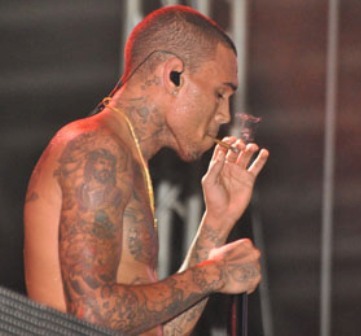 He basically got on stage and smoked ‘wee’ or what seemed to be wee and encouraged his fans in Ghana to do same. Whether or not it was wee, his message was audibly sent across, and the desired impact might be seen in a few years. Well I guess it is an issue the authorities to whom it may concern would have to look into. I say this oblivious of the fact that we are in Ghana and that we tidy the country by sweeping a lot of cases like this beneath the carpet. Anyway, I am more concerned about the response of Ghanaians to this issue than I am about the issue itself. Many people took to the various social media platforms to register their displeasure about the whole thing. This is pretty much expected considering the fact that good morals are held in high esteem in this country. The problem is those who took to the defense of the R&B singer by lashing out heavily at those criticizing his actions. Mental slaves, I call them. Here you are in your own country, defending a foreigner who walks in and breaks one of the laws of your country. Apparently, in so doing they attain a certain level of intellectual hierarchy ehh- pathetic!! More like the greedy chiefs who allowed the whites to have their way in Africa even when it was against our cultural precepts. Therefore I am saying, this must pass for one of the worst independence day commemoration in the history of Ghana. No matter what this couldn’t block the shine of GHANA AT 50. I would rather the principles surrounding the attainment of independence for this country be emphasized so that it would be instilled in the youth. Simple!!!!. And I am sure in doing so, it wouldn’t cost as a million dollars. And even if it did, isn’t it better???? Mental Slavery – Do we really understand the concept? Its amazing how much we pride ourselves in being an independent generation when the media and celebrities decide what we should wear, what’s cool and what’s not, what ‘beautiful’ is and a hot of others. I saw this piece and felt like you guys absolutely had to see this as well … Enjoy!